Laser Engraving iPhone and iPad Gorilla Glass - Laser Impressions Inc.
Laser engraving the Gorilla Glass on the back of an Apple iPhone 4. We can laser engrave your company logo along with “property of”, serial numbers or anything else you would like to personalize or unquely identify your Apple iPad, iPhone, iTouch or iPod. Laser Impressions’ propietary laser engraving process engraves beneath the glass so the glass is still smooth to the touch. We’ve found that this is much more elegant and professional way to insure your Apple products can be easily identified. Is device security a concern? No problem. Our experts can laser engrave a company logo along with “property of”, serial numbers or anything else you would like to personalize or unquely identify your Apple device. Laser engraving iPhone, iPad, iTouch or iPod is a great way to make sure that your device stays yours. 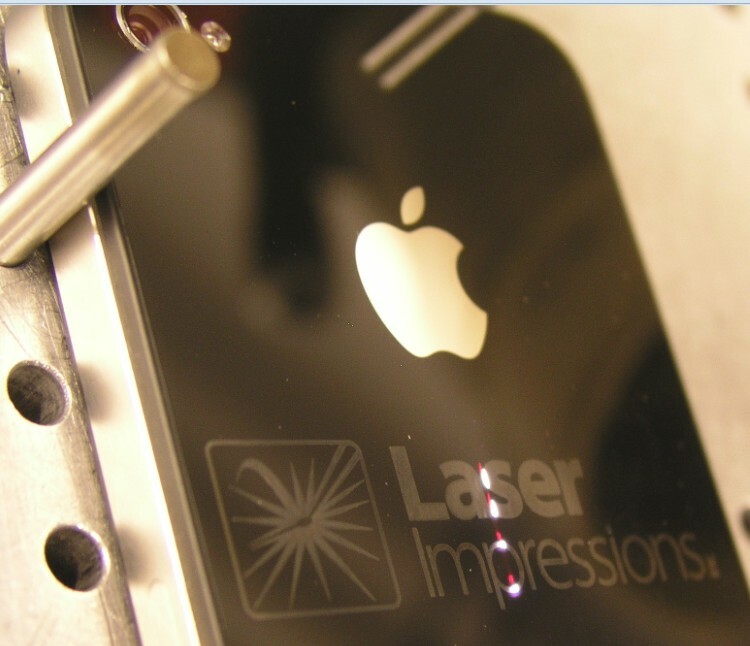 To learn more about how Laser Impressions can custom laser engrave your iPhone and other iDevices, call one of our iPhone laser engraving specialists at +1 (800) 344-5273.